Eggplant, Peppers, and Squash, Oh MY! Last week we helped pick vegetables from a friend’s 2 acre garden. We spent about a little over an hour picking long rows of squash and cucumbers, then a bit of eggplant and peppers. 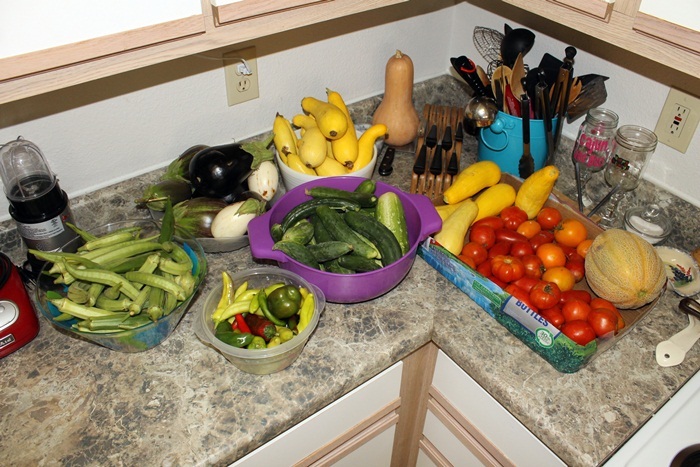 We were sent home with bags of all these wonderful veggies, and more. Okra, eggplant, squash, peppers, cucumbers, tomatoes, and cantaloupe. I was a bit overwhelmed by it all but we managed to devise a few ways to stretch and store it. I made pico, enough to fill two quart size mason jars. It is so good. I could almost sit and eat it all day. I made a small batch of spicy, roasted red pepper tomato sauce. I varied the recipe a bit, adding a little red wine, jalapenos, chili garlic paste instead of regular garlic, a little onion powder, parsley and basil. Using my previous post as a base for how to roast the tomatoes you can pretty much add whatever spices or flavors you want in your sauce. I’m really pleased with how the sauces are coming out. I made another huge batch a couple of weeks ago that is in the freezer as well. 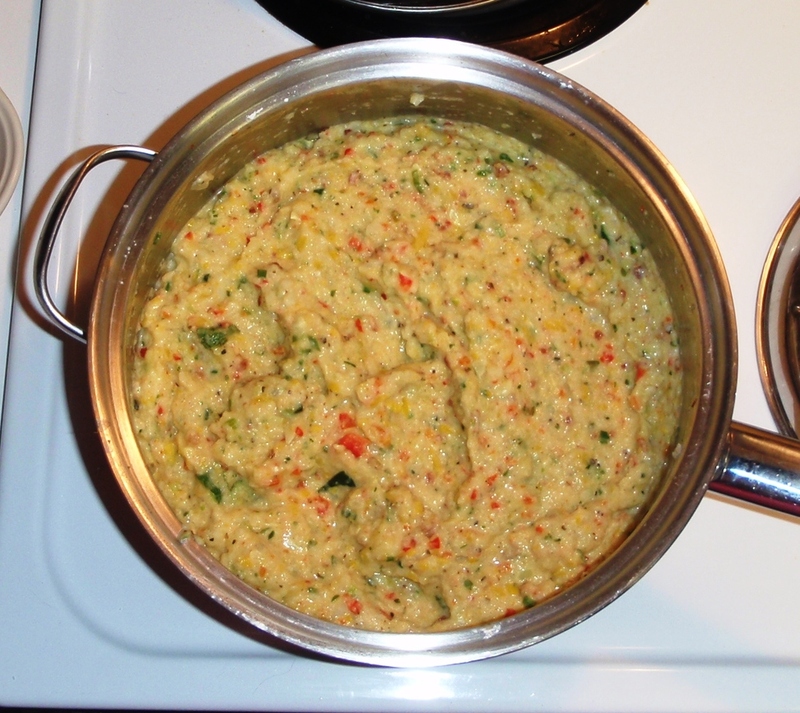 Don sliced the okra in 1/4 inch thick pieces, blanched it, and froze it in neat one-cup servings for easy use. He plans to try using it as a thickening agent instead of corn starch in future dishes. I filled 9 quart size mason jars with squash, sweet onion, cucumbers, and the peppers (banana peppers, jalapeno, and little red peppers of some sort) and pickled them with our sweet-spicy pickle recipe. Makes for great party food or just everyday snacking. We saved a few tomatoes for everyday use, a few squash for mashed squash, and peppers for spicing up dishes. And we still have all the eggplant. We’ve been meaning to grill some as a side dish but our dinners have just not been shaping up in that direction. Hopefully it will keep for a bit so we can enjoy it too. What a blessing. Thank you Phyllis for sharing your garden with us – and with Abraham’s Tent, a local soup kitchen. When eating fruit, remember who planted the tree; when drinking water, remember who dug the well. Don found recipes online to get him started (see examples here, here, and here.) It seems butternut squash is most frequently used for this dish but we had yellow crookneck squash and it seemed to turn out just fine. Don made use of his vast culinary talents that come so naturally to him (brat) and took a little license to add a few new things once he had a general idea of how to cook the squash. I don’t have actual measurements, alas, Don doesn’t really measure. It’s always a pinch of this, a few shakes of that. He just adds things by instinct and flavors to taste. Hopefully sharing this with you still provides some value, maybe some ideas, or some starting points. Forgive me for not getting any pictures of the process – I was making a breakfast casserole while he was making our smashed side dish. However, this is how it all turned out. Pretty isn’t it? Colorful, and tasty! 3 strips of bacon (mmm, bacon) – I really doubted him on that addition but once again, his instincts proved true. It was a good choice. Steam your cauliflower together with the squash and zucchini, or like us, you can steam separately using one of those little stainless steel vegetable steamers. No reason why Don chose to steam it separately this time around, he just didn’t think about doing it all together. Once everything is steamed to the softness that you like, drain the water, and combine all the veggies in one pan. Reduce heat to medium low. Add your other ingredients and blend together. A stick blender works wonders for us in this department (we like the Kitchen Aid one.) I’m sure an old school hand mixer would work just as well. I don’t think hand mashing would be very effective. Let sit for another five or ten minutes to get an even temperature throughout.